Another rasterizer might round things differently and place the curve on the wrong side. So it might be helpful to have a command which would search the glyph for places and pixelsizes where splines are close to the center points of pixels. 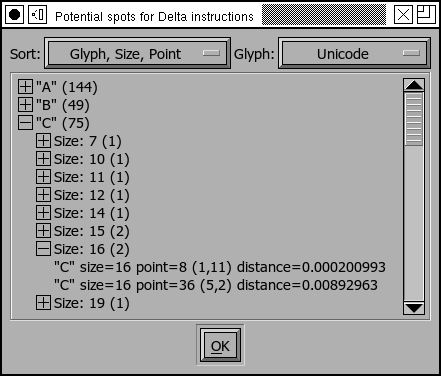 TrueType has an instruction called DELTA which allows you to move points only at certain pixelsizes. 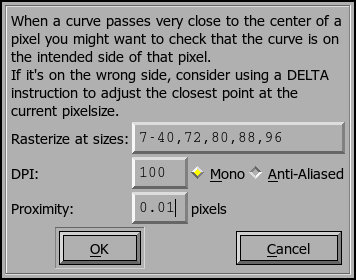 The dialog opposite will check the glyph at pointsizes 7-40, 72, 80, ... where the screen resolution is 100 for places where a spline comes within .01 (in pixel units) of the center of a pixel. The results will look like those at right. Clicking on an entry will toggle whether that entry is open (and its children visible) or not. If you click on one of the bottom level entries then fontforge will open a glyph view on that glyph, rasterize it at the current pointsize and resolution, and indicate the offending pixel by drawing a red box around it. As you can see, the pixel center point lies almost exactly on the spline. The closest real point is the control point #8. It is possible to reorder the list... depending on what is most important. At right data are organized by glyph, size and point. It might also be useful to see which points in a glyph are close to problems.